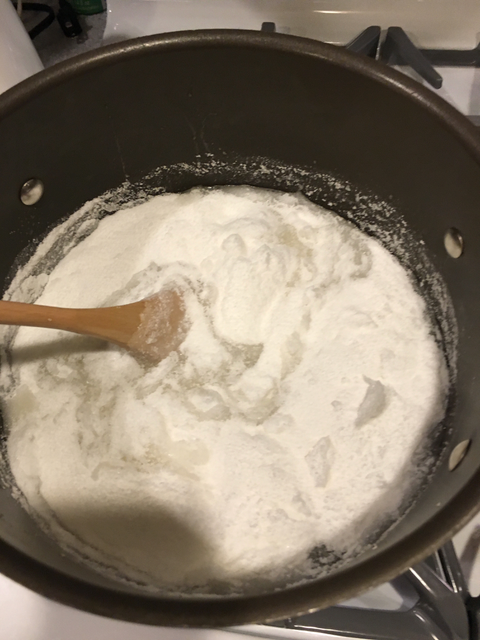 This page will show you how to make fondant for winter feeding. The original recipe on which this is based originated with Andy Guest, and was transmitted to me by one of my mentors, Toni Burnham. I have expanded the instructions, added some images and some hints from my own experiments. I also cut the recipe in half, because I don’t have a large enough pot for the 20-pound recipe, and this amount was easy to pour before it started to congeal. “Approximately 45 minutes per batch, including set up and clean up” — Andy’s original note. This batch is half as much so it will come to a boil more quickly. Once I had the hang of it I was finished pouring and cleaning up within 20 minutes. Read this page all the way through before you start to do anything. It is long and detailed, but you will spare yourself from some mistakes if you do. Set up your forms / molds before you begin cooking. The solution must be poured as soon as it has finished cooking or it will start to set in the pot, or it will get lumpy. Then it will set hard and things will get very difficult. Put the water and the vinegar into a large pot. Bring the water just to boiling. When boiling, add half the sugar (10 pounds / 2.25 kg) to the pot and bring it back to a boil, stirring frequently to dissolve the sugar. I found it easier to add the sugar slowly and stir it into the water, then add more, stirring constantly, until it has all been dissolved. Keep the temperature as low as necessary to bring the solution back to a boil. When the sugar solution just begins to boil, add the remaining sugar, stirring frequently. Again, adding the sugar slowly makes it easier to dissolve it nicely. If you dump it all in at once, as shown, it becomes very difficult to stir. Stirring constantly, bring the solution back to the boiling stage. It will be a slow bubbly boil because you now have a very thick solution. This is your molten fondant. Set a timer for 5 minutes and keep the molten fondant, just barely boiling. Stir often or constantly. You want to keep the heat under the solution as low as is necessary to keep it boiling, no hotter. You definitely don’t want the sugar to burn or begin to caramelize or you will increase formation of HMF in your fondant. I use a candy thermometer and I try to keep the temperature of the boiling solution at or below 220 ℉. When the timer goes off, pour the molten fondant immediately into the molds or forms that you set up earlier. The molten fondant is hot! It is hot, it sticks and it will burn you instantly. Do not let molten fondant drip onto any bare skin. Do not try to wipe up spills or the side of the pot with your fingers. Do not pop a taste into your mouth from the pot. These all may sound obvious to anyone who cooks, but for some reason, the boiling fondant seems so much friendlier than a pot of boiling water. Maybe because it smells sweet it is more tempting. I got a nasty burn on my lip and a couple on my fingers from my first batch. I still had not learned and burned myself on my third batch. Wearing heat-resistant gloves, such as oven mitts, is highly recommended if you can work with them on. Do not boil the molten fondant for more than 5 minutes or it will become too thick. 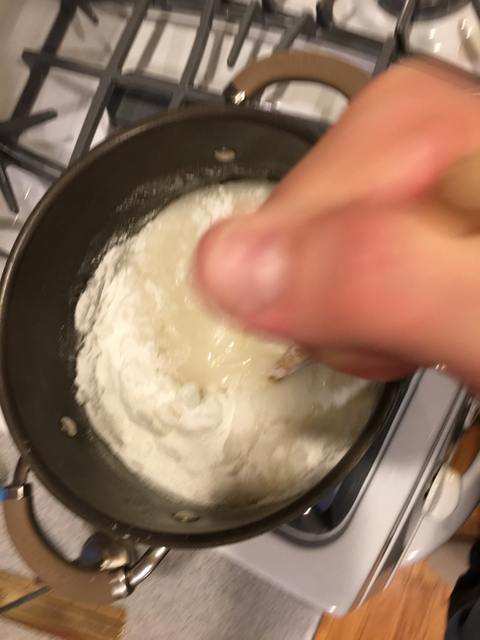 The sugar should dissolve completely if you stir it in gradually. 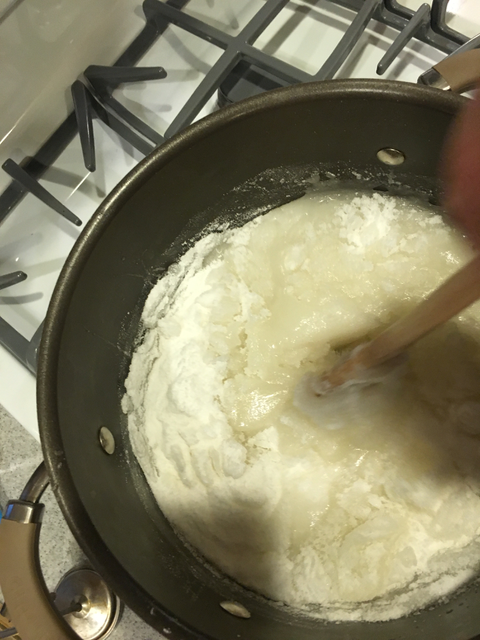 The recipe calls for adding the sugar in two batches, but you can add the sugar in smaller batches, or continuously while stirring, to help it dissolve more easily. The second addition is more difficult. Use a strong spoon for stirring. A good wooden spoon will work. A plastic spoon might snap in this mixture. An 8-quart pot will work well for a batch this size. You will need larger for a double batch. The molten fondant starts to solidify almost as soon as it comes off the heat. If it cools in the pot before you get it poured it will become lumpy. After it cools a little more, it will not be pourable at all. Have your molds or forms all set up and ready, close to the stove, so that you can pour immediately. Setting up your forms so that you can pour efficiently is tricky … ideally, you want to keep your pot on the cooling burner so that the fondant in the pot does not solidify as quickly. I tried using a ladle and found that I had too much sugar solidifying on it. I tried using a measuring cup and the sugar solidified in a candy coat around it. I finally tried pouring directly from the pot into the forms and that worked best. Do not make a stack of forms and hold one in one hand and pour with a ladle with the other. You will find yourself holding a hot plastic thing full of very hot fondant. There will be tears. You can lay out all your forms in rows near the stove, but moving them around when filled is tricky without heat-resistant gloves, and it slows you down. Perhaps the best strategy is to have a helper. When the fondant has cooked for five minutes, one will pour, the other will move the forms. Covering the surfaces where you will be pouring with newspaper, paper or cloth towels will make cleaning up much easier. Every drip and drop will solidify into candy on the surface that it hits. Once the fondant has been poured, allow it to cool for at least an hour before you try to release it from the form. If you used the plastic carry-out forms, invert the cooled fondant over a plate or towel and press gently on the back of the form to release the piece. Press on the outer edges of the form, not the center. I have read nothing about using any kind of oil or shortening to grease your forms and make removal easier. If you do try anything, make sure that it is 100% vegetable-based, and do some research to ensure that it will not be toxic to your bees. I found that the fondant released quite easily after it cooled. Baker’s sugar can be used instead of table sugar. Baker’s sugar dissolves more quickly and requires less boiling time. Baker’s sugar is the same molecule as table sugar, but more finely granulated. You do not have to change the quantity of sugar in this recipe because you are measuring by weight. If you use baker’s sugar, reduce the boiling time — 3 to 4 minutes after adding the last portion of sugar. You can also make the equivalent of baker’s sugar from table sugar at home with a blender or food processor. I think that you’ll spend more time grinding down the table sugar to baker’s sugar than you will save in boiling time. Your mileage may vary. 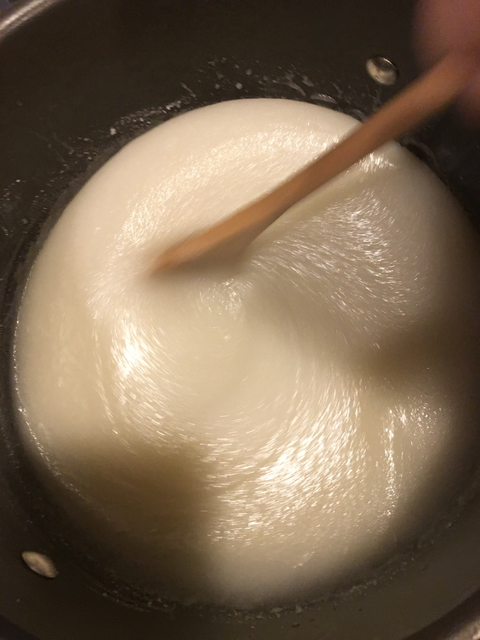 If your molten fondant solidifies too soon, or in the wrong place, or is too lumpy, or anyting else happens, you can redissolve it and re-pour it. Gather together all your “mistakes” and add them to a pot. Add a very small amount of water … much less than the recipe calls for per pound. You want just enough water that you can heat up the sugar and dissolve it again. Bring the pieces to a boil, stirring and breaking them to dissolve them into molten fondant again. When it reaches a boil, cut off the heat immediately and pour. Do not reboil the fondant. You can also add your mistake pieces to another batch that you are making. Just be sure to add the broken pieces in the last minute of the boil, so that they will dissolve into your molten fondant. You don’t want to reboil your fondant or you will start to release HMF. I use the tins that condiments come on. I get these from Cash and Carry. I used to use paper plates but they don’t hold for more than 2 batches and this year I’m making 1,000 plus. One batch makes about 18 paper plates about 3/8 inch thick.It does help to have a 1/2 rim around the top of your lid. I have almost finished putting the rims around my lids. I have a 120ish to go. I tried this last year on a much smaller basis and I have also found this candy sugar helps the hives. 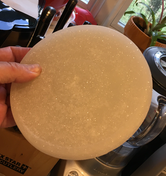 You can pour the molten fondant directly onto a plate, paper or otherwise, and it will cool and solidify into a circular, flat, cookie-like thing. You can also pour the molten fondant into some kind of form or mold. When it solidifies, you can release it into a shapely piece of bee candy. You will have best results with a form that is a little bit flexible or pliable so that the candy can be popped out. You can use disposable plastic containers, permanent plastic containers, aluminum pie pans, almost anything. 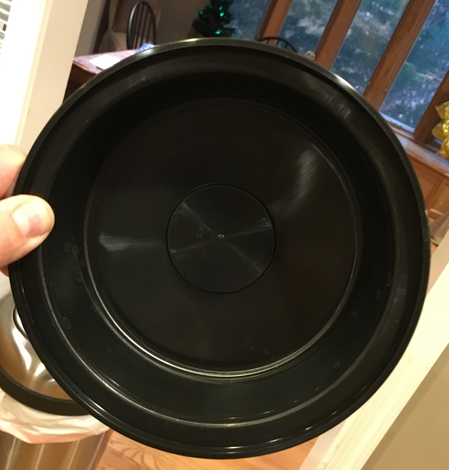 I chose to use the lids from the black plastic containers that restaurants use for carry-out or delivery. The translucent plastic lid is made of a thick enough plastic that it won’t melt when the molten fondant is poured. The inside diameter of each is about 6 1/8″ to 6 3/8″. You can use the black containers too, but they are slightly more rigid and you have to be more careful releasing the candy or it will break. 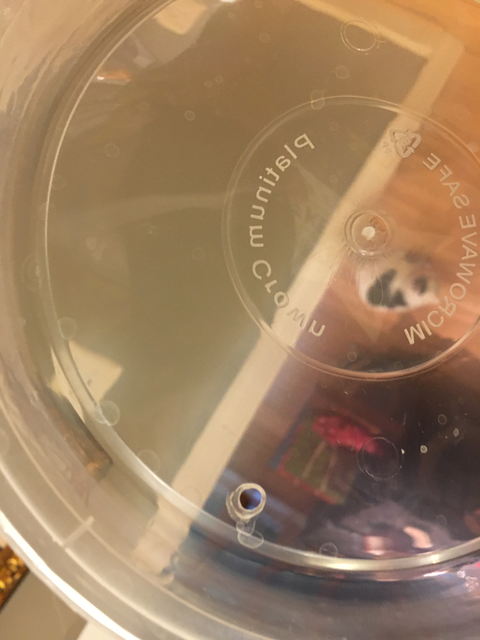 Check the lids for holes! 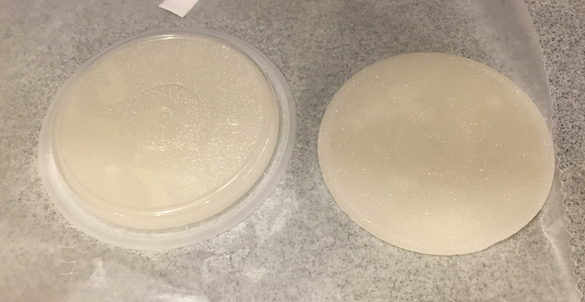 Often restaurants will puncture the lids to allow them to vent. You don’t want to discover this when you start to pour. Before you start making fondant, think about what size pieces you want to end up with, and select your forms from that. Where are you going to put the pieces of fondant? Will you need to add a “shim” or an extra box between the top of your frames and the cover (inner or outer) that will go over the sugar candy? Of course, you also want to use something that you have handy, or can acquire inexpensively. My first thought was to make pieces that were “bee space” thick — about 5/16″ (8 mm) in thickness. They would fit comfortably anywhere in a Langstroth hive. Unfortunately, these pieces were much too fragile and most broke into pieces when I was taking them out of the forms. I then decided to go with the depth of the lids, which was about 5/8″ (19 mm). Those were easier to work with. About a cup of molten fondant will fill the lids. I stack up 5 or 6 pieces of fondant with pieces of wax paper between them to keep them from sticking together, all sealed into reclosable plastic bags. I store unused fondant in the freezer when I have the space. It is sugar that has gotten wet, eventually it will get moldy at room temperature, even with the vinegar and the boiling. If you don’t have room in the refrigerator or freezer, I would keep it in several layers of trash bags. Place pieces of fondant directly on the top bars of the hive box. If you will use an inner cover, it should go above the fondant and below your inner cover, quilt box, etc. You can also slide a chunk of fondant between frames as long as it will not disturb the cluster. The most important part of putting fondant into the hive is to work fast. If your fondant is crumbly, you can put it on top of a single sheet of newspaper on the top bars. Hydroxymethylfurfural (HMF) is a chemical that is toxic to honey bees. It forms when sugars are heated. Increased HMF formation also occurs in acidic and alkaline solutions. The sugar that forms HMF at the lowest temperature is fructose, at about 230 ℉. That is why I recommend keeping things boiling with as low a stove temperature as possible. When you make a sucrose solution acidic (adding the vinegar) and heat it, you are creating an invert sugar solution. Most of the sucrose will break down to the simple sugars glucose and fructose. This is similar to what happens when bees add their enzymes to nectar in the process of making honey. The bees add an enzyme called invertase that catalyzes the reaction. Once the sugar has been inverted, the heat will start generating HMF from the fructose. The less HMF that you put into your hive, the fewer winter bees you will be killing. So, keep your temperatures as low as you can. If you burn, brown, caramelize or overcook your fondant, throw it away! You are trying to help them stay alive, not poison them. Don’t confuse this with the stuff you make for icing cakes, and definitely don’t buy it from anyone except a beekeeper.